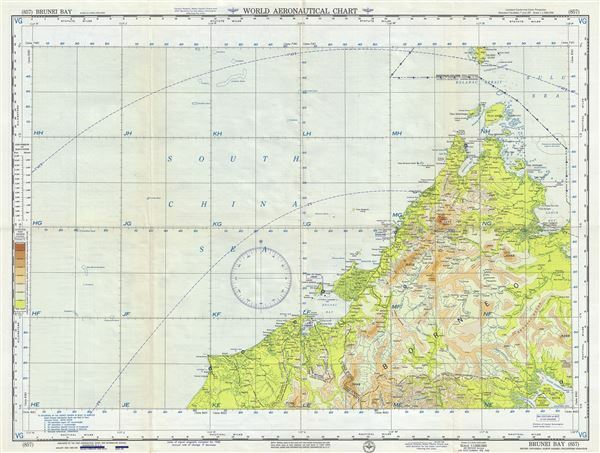 This is an uncommon 1958 U. S. Air Force aeronautical chart or map of northern Borneo. Focusing on Brunei, it covers from Miri in Malaysia north including Brunei to Balabac Island, Philippines and east to Pulau Sebatik. It notes important cities, rivers, international boundaries, bays, reefs, topography and other data essential for the air pilot. Verso features legends and a world aeronautical chart index. This chart was published by the USAF Aeronautical Chart and Information Service, Washington 25, DC, and issued as chart no. 857. First issued in 1948, this is the eight edition revised to Feb. 1958. Very good. Minor wear and toning along original fold lines. Minor edge wear.